Ever since the dawn of word processors, most of us spend more time in formatting rather than the content – which is sad and inefficient. This problem becomes worse if you have to copy paste from documents created by different people. 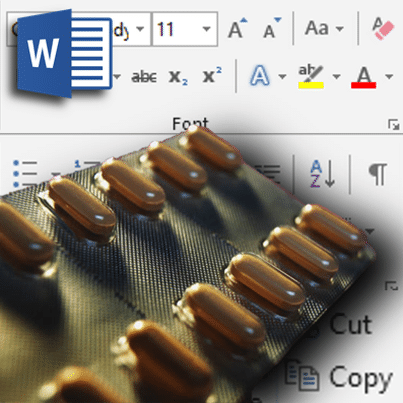 Word has many great features to help you conquer this problem. 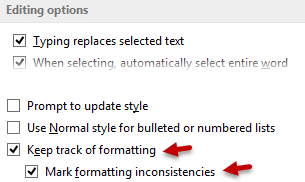 Detecting Formatting Inconsistencies is one such feature… It is NOT active by default. Here is how you use it. What exactly are formatting inconsistencies? If you perform formatting manually, it means YOU are helping WORD! Word now actively looks for areas where manual formatting is applied on top of styles. Whenever it finds inconsistent formatting, blue wavy line appears. Right click on it and choose the option – Replace direct formatting with style Normal. You may have to repeat this process if there is lot of manual formatting. Can I change multiple inconsistencies of the same type in one stroke? Yes. But using another feature. That should remove manual formatting and keep the underlying style unharmed. What if there is a contextual spelling error and formatting inconsistency in the same text? As you know, both show up as blue wavy lines below text. The formatting one gets precedence. So first right click will help you apply correct style. But the blue line will not go away. Second Right click will help you correct the contextual error. Try this and let me know if it reduced your formatting related manual work! By the way, the best way to PREVENT this is to ensure that your entire team or department or organization uses styles. Ask them to read this article! Don’t know why but for the last two times the links are incorrect. While I still go and search for the post, it would be awesome if you could have this acted upon.